The owners of this home were longing for a warm, welcoming kitchen and living room space. Our mission was to create a cohesive color palette and design for both the kitchen and adjoining family room that would maximize their entertainment space. We highlighted the tall ceilings by designing ceiling-height cabinetry and added paneling to the remaining wall surfaces. 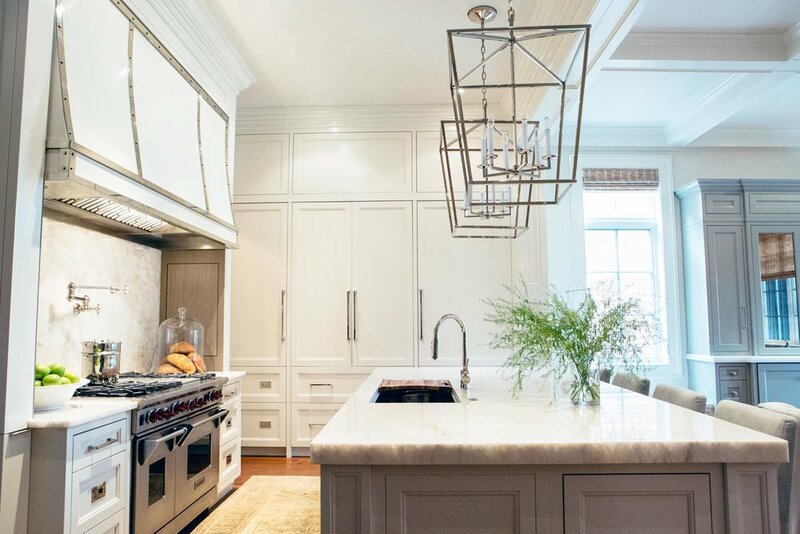 The high-gloss custom kitchen hood with polished nickel trim and stained cabinetry accents add texture and depth. Details in functionality, such as a banquette nook with a dining table that is the same height as the island, facilitate easy conversation among guests. The mirrored barmoire and window seats add additional areas for entertaining while reflecting the adjacent seating grouping.